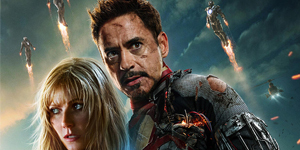 Here is the final movie poster Iron Man 3 featuring Pepper Potts and Tony Stark and Stark’s slew of Iron Man suits. For a final poster, this one certainly delivers the goods. Be sure to check out the latest theatrical trailer yesterday, and get psyched for this film!